Lithuania will purchase the Klaipeda LNG terminal's floating storage and regasification unit (FSRU), named Independence, from Norway's Hoegh LNG after 2024, informs LETA/BNS referring to the government's Economic Infrastructure Development Commission. Long-term borrowing from banks by Klaipedos Nafta, the LNG terminal's operator, will help reduce the terminal's costs for users, particularly the fertilizer manufacturer Achema, the energy producer Lietuvos Energijos Gamyba (LEG) and other large energy producers. In the commission's opinion, this is the most economically advantageous and strategically sustainable option for Lithuania, the government said. "Given Lithuania's need for securing long-term LNG supply in the future, both for its energy security and competitive prices, we chose the option that provides the greatest economic effect and is strategically the most sustainable in the long term," Energy Minister Zygimantas Vaiciunas said. 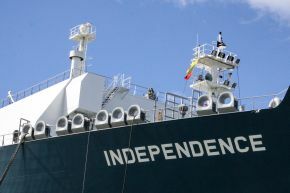 "Lithuania will retain access to international LNG markets, while at the same time having the greatest flexibility and the ability to swiftly respond to the changing market situation in the future," he said. A long-term lease of the FSRU was the other option considered by the commission. It is proposed to spread the terminal's costs for users over a longer period of time, which will help reduce these costs by at least 23 mln euros – from 66 mln to 43 mln euros – annually starting in 2019, the government said. Estimates of the FSRU purchase price range between 121 mln and 160 mln euros, but the exact price set in the contract with the Norwegian company is confidential.